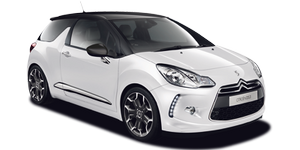 The DS3 is the first of Citroen's luxury cars which accompany its regular ranges. But unlike the C3 on which it's based, the DS3 is much more fun to drive, with a very agile chassis, excellent handling and a great 1.6-litre turbo engine in the top of the range car. But thanks to its humble origins, the DS3 is also very cheap to run. The interior is well made too, feeling very high quality and featuring plenty of standard kit. Buyers can also personalise their cars, choosing from lots of paint and trim combinations.